THIS FRIDAY !! The Rockettes want you there ! THE ROCKETTES CANT WAIT TO SEE YOU THERE !!! SWSR are thrilled to bring you another amazing array of items, generously donated by our sponsors for our very first fundraiser for 2013 ! With over $1000 of goodies to be won, in three huge prize packs, we are sure any derby girl will go home smiling with whatever you win from the three derby packs be raffled. 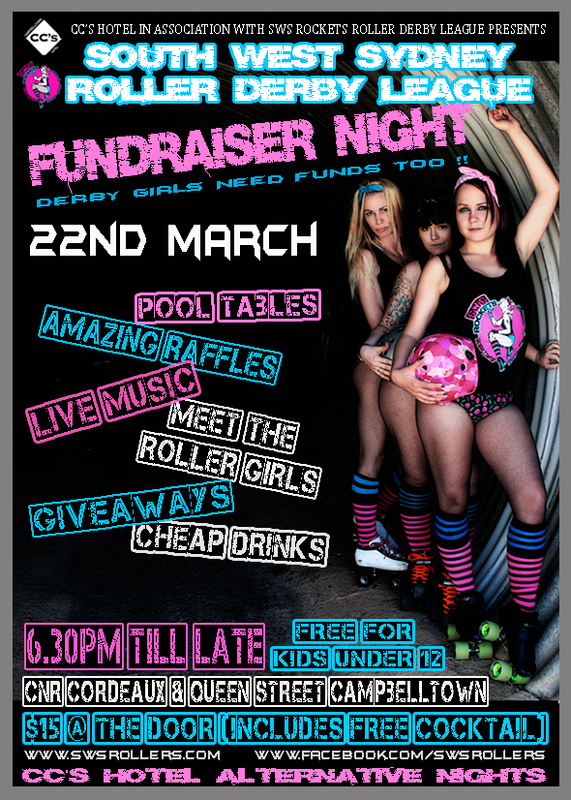 The Derby raffle will take place at CC's hotel on March 22nd, with each raffle winner getting the chance to choose any or the remaining Roller Derby pack they wish from the 3 pack prize pool on offer. Be sure to get sown early and get your hands on some raffle tickets for your chance to win some amazing prizes! The Standard Raffle tickets are $5 each, 3 for $10 !! click below for more details about this event !! SWSR are thrilled to bring you an amazing array of items, generously donated by our sponsors for our very first fundraiser for 2013 ! With over $1000 of goodies to be won, we are sure you will go home smiling with whatever you choose from this large collection of items to be raffled. The standard raffle will take place at CC's hotel on March 22nd, with each raffle winner getting the chance to choose any item they wish from the prize pool on offer. The Standard Raffle tickets are $2 each, 3 for $5 or 10 for $15 !! That we are giving away five fantastic ladies or mens underwear !! For your chance to win a pair of these amazing daks, simply share our facebook event ! !